Speed up fulfillment and improve the customer opening experience with our pre-applied peel & seal taped edge packaging. Make your eCommerce packaging stand out from the crowd. With the option of printing on the inside and outside of the box, you can create packaging tailor made for your customer. Build your brand with CBS Packaging. We create packaging to tailor made to your specifications. Our expert sales and design team can help you create packaging that is ideal for your product. We will be able to give you assistance on the types on the box style, board grade and print options we can create. If it’s a standard box style or a even more intricate lock flapped die cut box we will be able to talk you through the options. We have over 20 years experience manufacturing corrugated boxes and our new machinery has added the ability for us now to add peel & seal adhesive strips to our eCommerce packaging options. We can create your packaging from a wide range of board grades to suit the requirements of your product and budget. From premium Kraft paper to test liner, with our own paper supply we create packaging using the highest of quality paper. 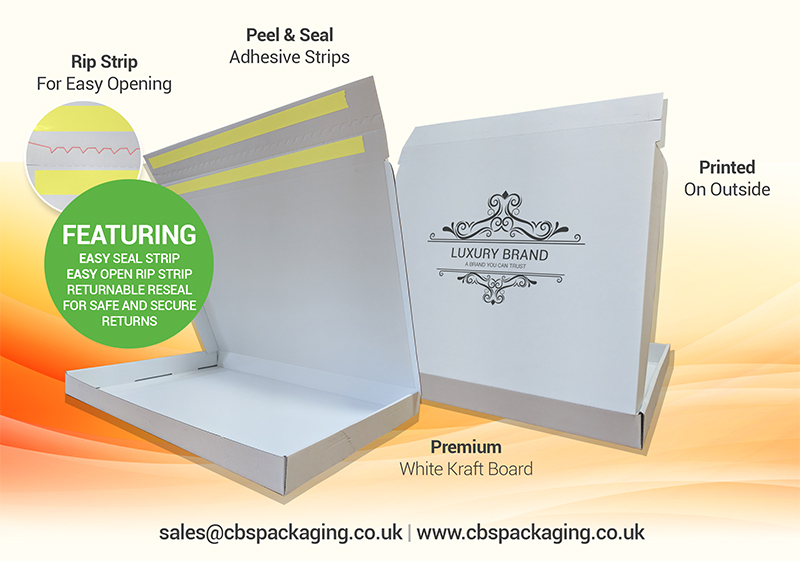 Easily seal your packaging with the pre-applied adhesive strip, speeding up warehouse fulfillment times whilst making your packaging more presentable. Open packaging in seconds with the one-use rip tear strip, improving the customer opening experience while also acting as a tamper evident solution, alerting the receiver if the packaging has already been tampered with. Make customer returns simple and easy with the 2nd pre-applied adhesive strip. Making sure your product gets back to you safely. We can print on both sides of the box with our 6 colour print machine(4 one side, 2 the other). Build your brand with your packaging by getting your message across to your customer base.